Scholarly activities are considered an essential and integral part of our program. Residents are required to pursue independent scholarly activities or participate in ongoing research activities with any of the plastic surgery attendings throughout their residency training. 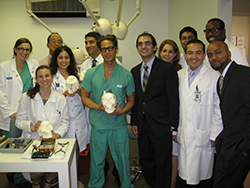 The Department of Surgery sponsors an annual Research Day in May of each year. All the surgical residents are required to submit an abstract of their research projects. Abstracts are selected by a panel of judges to be presented as either an oral or poster presentation during Research Day. The expectation is that the work and abstracts will eventually be submitted for presentation at regional and national meetings. In addition, the Department of Surgery supports an active microsurgery laboratory. A formal microsurgery lab rotation is in place as part of the curriculum in order to allow our residents to learn microvascular techniques from a dedicated staff in our microsurgery lab. An in-house medical illustrator is available to all residents and attendings.